Contents: Introduction; Theoretical Perspectives on NDM: The current status of the naturalistic decision making framework; In search of naturalistic decisions; Stress and naturalistic decision making: strengthening the weak links; Merging paradigms: decision making, management and cognitive control. 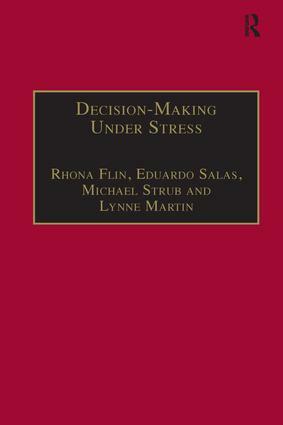 Decisions in Civil Emergencies: Critical incident management simulation; A framework for building and testing models of recorded team decision making; Decision making patterns in major fire-fighting and rescue operations; Psychological research and development in the London Fire Brigade; Design of the natural: an engineering process for NDM; Head-mounted video recording: a methodology for studying NDM. Military Command Decisions: On-line coping with uncertainty: beyond the reduce, quantify and plug heuristic; Improving critical thinking; Team adaptation and co-ordination training; Dynamic decision making in non-routine situations; Surrender at Perevolochna: a case study of perspective and action control in decision making under stress; Enhancing effective decision making by information management techniques; Military decision support. Decisions on the Flight deck: Military pilot performance - dynamic decision making in its extreme; Understanding expert aviator judgment; Decision making training for aircrew; Selection for stressful jobs: is the defence mechanism test the solution? ; Pilot mental workload and situational awareness - psychological models of the pilot. Analysing Decision Making Under Stress: Strategies for adapting to time pressure; Emergency decision making - a wider decision framework? ; Decision making in complex situations: cognitive and motivational limitations; Differentiation and consolidation theory; Analyzing team skills; Toward an understanding of stress on organizational social systems in complex, dynamic, environments; Appendices. Rhona Flin is Professor of Applied Psychology at the University of Aberdeen, Scotland, UK; Eduardo Salas is Senior Research Psychologist and Head of the Training Technology Development Branch of the US Naval Air Warfare Centre Training Systems Division; Michael Strub is Chief of the US Army Research Laboratory London Research Office; Lynne Martin is at NASA Ames Research Center.